A bald man in a blue jacket stands up straight next to a chair. He is positioned against a large shape in the background. His eyes are looking to his right. His left arm is bent, elbow leaning on the back of a chair, fingers holding a cigarette in front of his mouth. The man’s right hand is tucked into the side pocket of his trousers. He wears a bright orange button-down shirt with a striped tie and a V-neck cardigan. A blue fitted jacket encloses his imposing wide-shouldered torso. His intense, focused stare rouses my curiosity. I glance at the object, as it were, of his attention. To my left, in another painting, another figure of a man stands in a brightly lit room. His body is positioned uncomfortably, leaning on the back of a chair with his right arm bent. He wears a white, tight-fitted sailor’s hat. The right side of this man’s face is highlighted, his eyes are looking at the viewer, a black cigarette resting in the corner of his mouth. The room is awash with light. Its powerful glare is applied in large, smooth brushstrokes. The man’s attire is reminiscent of the aforementioned sailor’s attire. His intense gaze is directed at us. There is a wonderful simplicity in the execution of this self-portrait. There is neither exaggeration nor doubt in the application of color. Confident, wide brushstrokes define the areas of light and shadow, creating an atmospheric effect. The man’s face is intense and even confrontational. The dark, jagged line between the arches of the eyebrows suggests a prolonged inner turmoil, confirmed in the direct, non-forgiving scrutiny of the eyes. The thick, slightly curved black line of the cigarette mimics the resentful expression of the figure’s mouth. The diagonal line of the upper right arm ends at the tightened, raised shoulder. Despite the emptiness of the interior, the figure appears to be forcefully confined between the painting’s edges. The weightlessness of Beckmann’s earlier self-portrait is gone. So is his reluctant pose and accusatory glance. The artist is assertively standing in front of his canvas, his wide shoulders relaxed yet self-confident. A tailored, cobalt blue jacket is outlined in black. A deep burnt-sienna background is interrupted by the dark, mysterious and shadowy space of the unfinished canvas. The spiraling back of the cerulean chair offers comfortable support for the man’s bent left elbow. As if caught in a moment of quiet and keen contemplation, the man seems unconcerned with the viewer as intruder. 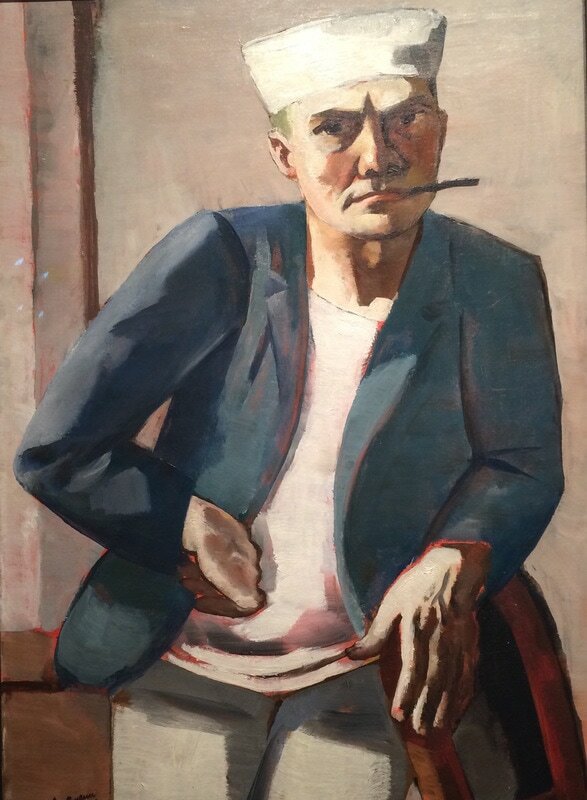 The artist is Max Beckmann, who belonged to a group of 20th century European artists whose oeuvre is inseparable from the set of social and political circumstances of the time. Witness to WWI and the rise of the National Socialist movement, Beckmann left Germany, his homeland, in 1938, never to return. 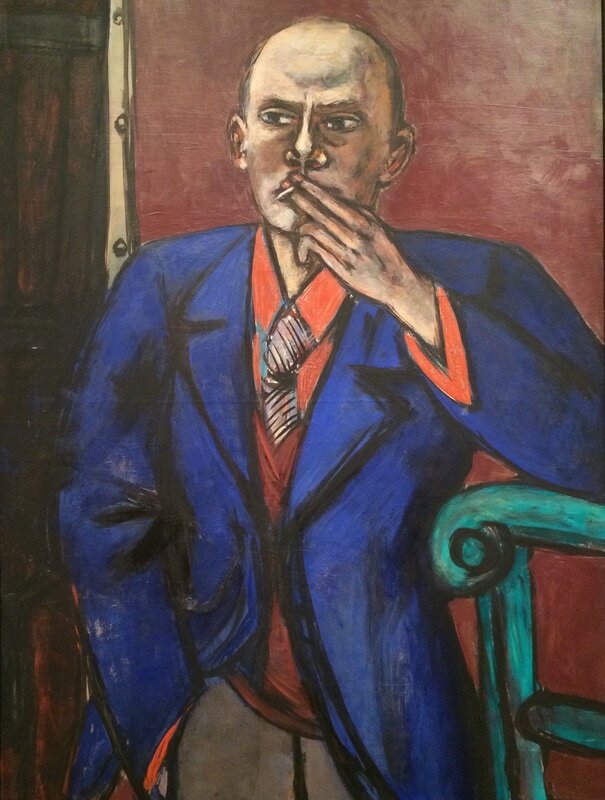 Spending the rest of his life in self-imposed exile, first in the Netherlands then in the U.S., Beckmann delicately weaved social and political issues into his art, and remained an authentic and resolute narrator of the human condition. For Beckmann, cognition of the truth in art was inseparable from self-cognition. His many self-portraits, are not a product of a narcissistic impulse, but rather, multilayered and uncompromising artifacts of humanity’s fate. ​ Beckmann’s show at the Metropolitan Museum of Art offered a brief survey of the artist’s work spanning a few decades. 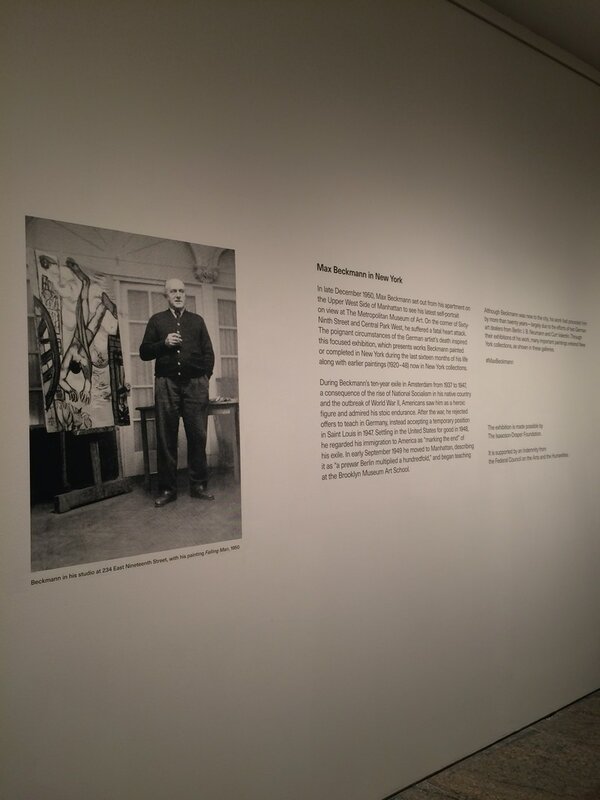 The title of the show, “Max Beckmann in New York,” seemed forced because most of the paintings were neither conceived nor executed in the city. The exhibition was designed according to the artwork’s subject matter, rather than chronological continuity. The decision to group the artwork based on a specific theme, appeared to cater to the uninitiated museum visitor. Due to this, I found some of the rooms distracting and visually cluttered. The most distracting however was the attempt to “interpret” Beckmann’s painting “Falling Man” by relating it to recent events. This kind of superficial reading of a painting, not only dishonors the artwork itself, but even more importantly, deprives the audience of its desire to discover. Buenger, B. C. (1997). Max Beckmann: self-portrait in words: collected writings and statements, 1903-1950. Chicago, IL: University of Chicago Press. I was not familiar with the work of Henri-Charles Guerard before visiting the exhibition of his prints at the New York Public Library Main Branch in February. I have to admit that it was the “curious” image and the title of the show that initially lured me in. The image was the impression of Guerard’s left hand – a simple yet undoubtable statement of one’s existence. Henri-Charles Guerard was born in Paris in 1846 and, like many artists of the time, studied law before discovering his true, artistic calling. Even though originally trained as a painter, Guerard’s most significant contributions are in the medium of printmaking. His short but productive life ended in 1897. Immediately upon entering the exhibition space, one notices the broad spectrum of the artist’s interests. From the reproductive prints based on the work of Rembrandt, Velasquez, Manet, and Botticelli, to the experimental, original prints, to the surprisingly modern-looking prints of fine-art ephemera. The artist’s comprehensive interests are also obvious in the wide variety of themes he explored in his artwork. Among the vast array of themes and influences, death appears to be the constant one. Guerard explores the finality of the human condition with a curious sense of mystery and humor. One of the prints is Les Cocottes de la Mort (The Origami of Death,1875). 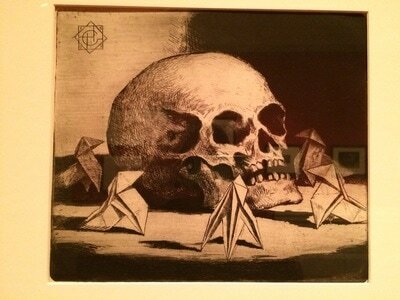 This still life print shows the smooth, curved shape of a human skull surrounded by the images of five origami figures. Both the skull and the hostile looking origamis are sitting on a flat surface in front of the black and white background. The contrasting lines of the curved, organic skull and the sharp, linear man-made forms of the folded paper create a strange sense of animosity in this group of inanimate objects. The carefully staged and illuminated composition furthers the print’s dramatic effect, as the cloaked, anonymous messengers threaten to overwhelm the captured. Theatrical lighting indicates inevitability as the darkness of the black closes in. 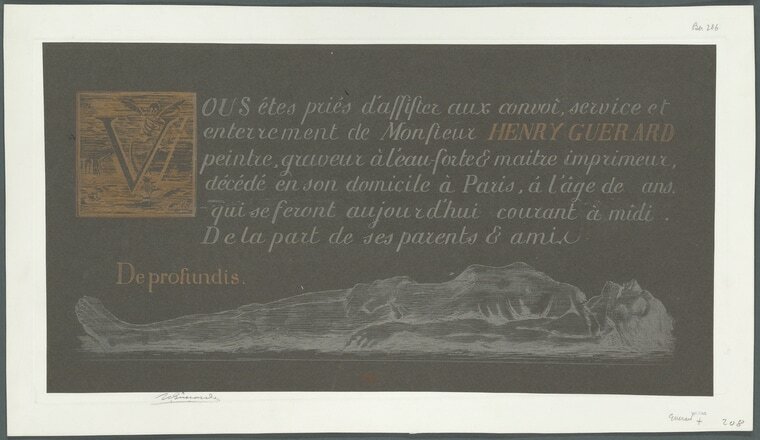 Without the symbolic character of the previous print, De Profundis (An Imaginary Funeral Announcement, 1888) is nonetheless equally interesting. 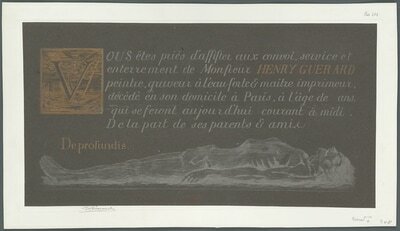 This print is an alarming simulation of the artist’s funeral invitation. It combines the biblical text with the image of a naked, emaciated, and prostrate human figure. The image is printed on black paper with gold and silver ink. The elongated horizontal composition is emphasized by the “tight-fitting” lying figure. In this etching, Guerard renders the figure with utmost delicacy. As a result, the deceased appears almost veiled with a most exquisite, woven shroud. The ephemeral image of the body on the lower third of the composition is well juxtaposed with the definite finality of the psalm above. Created nine years before the artist’s death, De Profundis is a disturbing meditation on a self-fulfilling prophecy. I found Guerard’s avid, lifelong readiness to learn humbling and inspiring. As we often lose ourselves in a race to outsmart others, and aggrandize our own contributions to the art, we can learn from Guerard that genuine authenticity is unassuming. 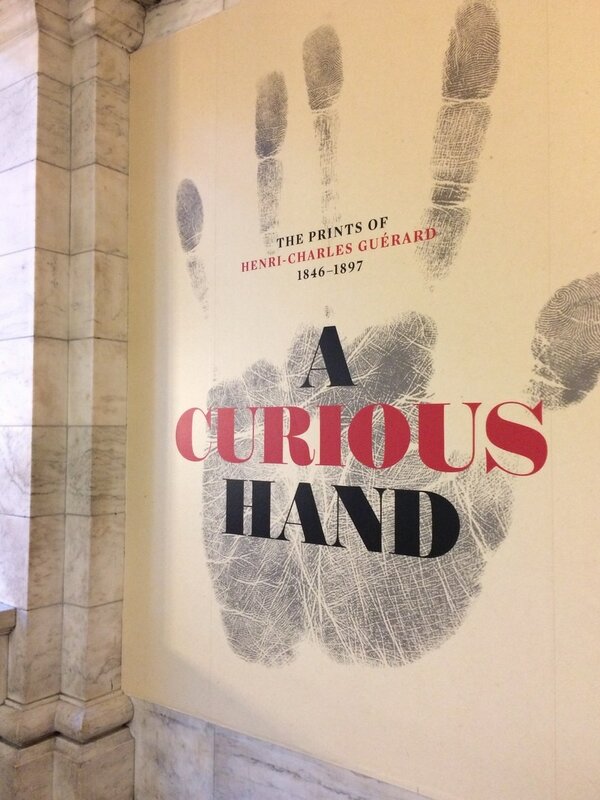 The exhibition, “A Curious Hand,” is a comprehensive profile of one artist’s lifelong body of work, and as such is a great resource for art teaching. Guerard’s personal, and friendly relationship with Manet and his predecessors’ stirring reproduction prints are a great example of how artists collaborate and draw inspiration from their peers. His interest in the art of the Far East, specifically that of the Japanese print master Hokusai, is relevant to today’s all-inclusive, global visual culture. Finally, probably most relevant is Guerard’s tireless drive to experiment, innovate, and develop. This experimentation and development was obvious in the exhibition’s display of many process pieces. Be it a ruptured paper print simulating a snow effect, Botticelli’s light-to-dark “Primavera” prints, whimsical many-colored “portraits” of his dog Azor, or the floating head of a black cat printed on the daily newspaper page, Guerard’s work confirms and justifies the intriguing title of his show.